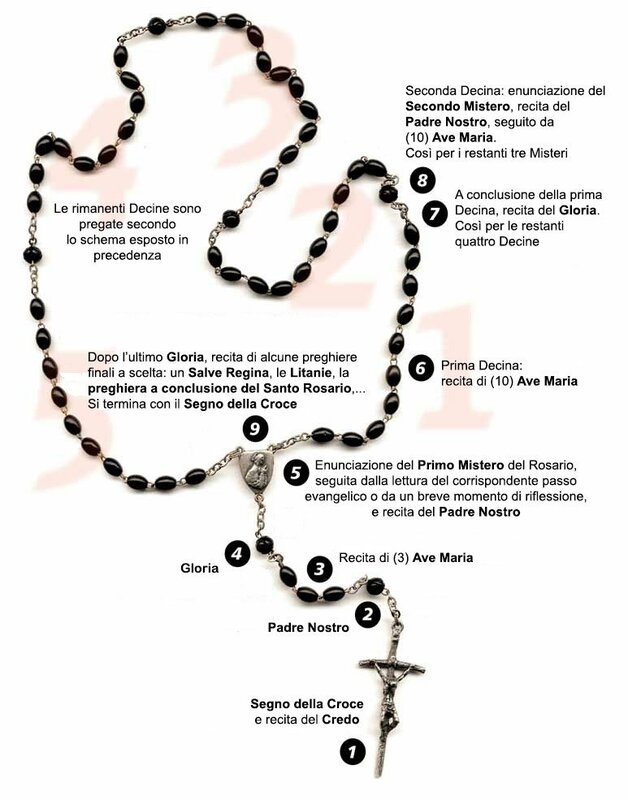 The word Rosary means “Crown of Roses”. In different revelations, Our Lady confirmed that every time we say a Hail Mary it is the same as we give her a beautiful rose and with each complete Rosary we give her a crown of roses. The rose is the queen of flowers as the Holy Rosary is the queen of all devotions, the most beautiful and most important one. The Holy Rosary is always considered a “complete” prayer because it represents a summary of our history of salvation. With the Rosary we meditate the five “mysteries”: the joyful mysteries, the mysteries of light, the sorrowful mysteries and the glorious mysteries of Jesus and Mary. When we invite our Heavenly Mother to pray for us with the Hail Mary, the Virgin Mary herself joins us to our prayer raising it and making it more perfect to our Father’s eyes. Praying the Rosary is never vain, because when the Virgin Mary asks for something, she always obtains it since she is the Omnipotent by Grace! In all the apparitions, our Heavenly Mother always encouraged us to pray the daily Rosary as a powerful weapon against Evil, for the sinners’ conversion and for ours and our neighbor’s sanctification. 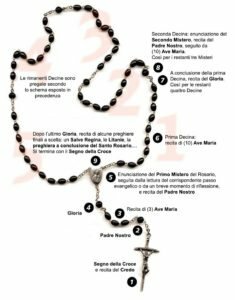 ⇒ For more information on the origins of the Rosary, click HERE. Make the Sign of the Cross (1) saying: “In the name of the Father, and the Son, and the Holy Spirit. Amen”. I believe in God, the Father almighty, creator of heaven and earth. I believe in Jesus Christ, his only Son, our Lord, who was conceived by the Holy Spirit and born of the virgin Mary. He suffered under Pontius Pilate, was crucified, died, and was buried; he descended to hell. The third day he rose again from the dead. He ascended into heaven and is seated at the right hand of the Father. From there he will come to judge the living and the dead. I believe in the Holy Spirit, the Holy Catholic Church, the communion of Saints, the forgiveness of sins, the resurrection of the body, and the life everlasting. Amen. “O my Jesus, forgive us our sins, save us from the fires of hell, and lead all souls to Heaven, especially those in most need of Thy mercy” (Our Lady in Fatima, July 13 1917). At the end of the five decades we pray the Hail, Holy Queen. At the end of the Rosary, the Loreto Litany prayer is recited. Hail, holy Queen, mother of mercy; hail, our life, our sweetness and our hope. To thee do we cry, poor banished children of Eve; to thee do we send up our sighs, mourning and weeping in this valley of tears. Turn then, most gracious advocate, thine eyes of mercy towards us; and after this our exile, show unto us the blessed fruit of thy womb, Jesus. O clement, O loving, O sweet Virgin Mary. Amen. Grant, we beseech thee, O Lord God, that we, your servants, may enjoy perpetual health of mind and body; and by the intercession of the Blessed Mary, ever Virgin, may be delivered from present sorrow, and obtain eternal joy. Through Christ our Lord. Amen.